None of us have fully recovered from the launch party of Snowskull's new online enriched arts project (and our first official release in a long time). Ridiculous fun was had in Cardiff that night, and for some nights afterwards, not to mention the incredible sets from Jauge, Blured, Dubs, Owls and Daniel Avery. 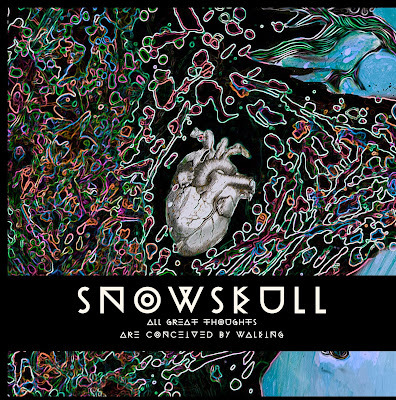 The release is the soundtrack to Snowskull's exhibition and was created by some of the above alongside Snowskull himself. There's a link to the music below but you'd be foolish not to experience the whole exhibition 'All Great Thoughts Are Conceived By Walking'. Also XLR8R are giving away a free instrumental copy of the Snowskull & Jauge track. Very much excited at the prospect of a Mo Kolours album. His tracks are little slices of sunshine that keep pulling me in. Just pre-ordered a digital copy, though love the artwork (by Miju Lee) so sorely tempted to go back for the vinyl / tshirt option. Order yourself a copy here, it drops on 24th March. New video from soulful electronic duo, K.Raydio and Psymun, whose beautiful debut album, LucidDreamingSkylines was a late entry for one of last year's best releases. Still fresh so if you haven't caught it yet then peep the video and head over to their Bandcamp. 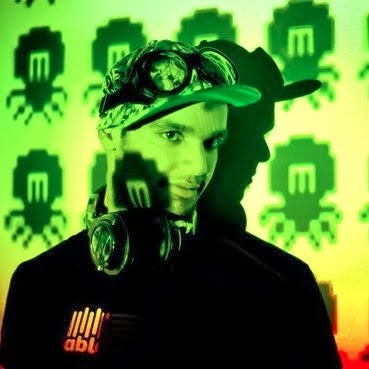 Moduloktopus was quite possibly our favourite Bass music producer of last year with more killer bootlegs then we could keep up with, mixing up Grime, Trap, Dubstep, Drum N Bass, Jungle and Juke influences but managing to make it sound more soulful and exciting than many of the others in those fields. Now he's offering his whole back catalogue of work for free download, so we suggest you grab it quick from the link below before he changes his mind. Okay, so I said I would post some more releases from the end of last year, but actually going back over them, they don't stand up to yesterdays, so I'm no longer going to. However here is an album that we overlooked in the summer from the man like Channel Swimmer. Met this dude at Swn Festival in Cardiff as he was Djing just before me. I kept asking him who the tunes were by and each time they were his own productions (I kind of got the idea after a few and stopped bugging him). I've had a couple of these from him since but here's a quality concise (okay so 26 tracks maybe isn't that concise) introduction to an oft overlooked Welsh producer with a keen ear for a sample. Well 2014 and we're still here. I'm not sure if there's any of our original readers left but we massively salute you if you've grown along with us. Certainly we've lost a few along the way: after we no longer became inspired by what was happening in Dubstep; after we no longer saw the progression in many of the Glitch hop artists, after we craved soul over aggression, quality over quantity and being fresh over being first. After we nearly lost hope, but realised we could never lose our passion for this music that breathes so much heart, humanity and feeling into the machines that even a Blade Runner would have to admit they were very much alive. To be honest, we don't care if there are fewer of you out there paying attention over here, so long as there's beautiful electronic music that needs better exposure, we'll be here. We've no doubt this year's going to be great for music and we hope to se you all in 2015. Here's a few releases from the end of last year that we feel you should hear. We'll post a few more tomorrow. Perhaps this Chicago rapper's most accomplished release yet. As smooth, intelligent and thoughtful as ever with the rhymes, whilst the production is first rate with names such as Bobby Tank, Mr Dibiase, SoulParlor and long time sparring partner DJ Vadim. It also credits Moodyman though I think this might be a mistake as one track has Pugs and Cerebral Vortex rhyming over Oliver $'s 'Doing Ya Thang' which samples Moodyman's butter like vocals. If there is a genuine Moodyman production on there though I'd love to know which one it is. As well as that particular foray into the much missed world of Hip-House, the production leans heavily on the Future Funk, as you might expect coming from the Tokyo Dawn label. Great album for this time of year, complimenting both sunset and sunrise, with lush lullaby vocals, as full of Jazz and dreamlike Soul as the crisp production. Just beautiful. In my other life I often dip into the world of Electro Blues and this wouldn't be out of place there, though with fantastic forward thinking production, it definitely has a place by the fire here also. There's also something of a Blues edge to these decidedly more Indie vocals which never the less massage the beats into soulful submission, after they seem to desire breaking free into a Juke frenzy at times (but never quite do). Slow Dance from Martinus Klemet on Vimeo. First mail of the year comes from King Deluxe who sent us this lovely Rome & Juliet / West Side Story style animation by Martinus Klemet. The track used is Calvin Cardioid's 'Slow Dance', a King Deluxe release from 2011.